Sorry I haven’t written up my blog redesign process yet. I have been extremely busy at work and that has drained me for the rest of the time. All my projects are suffering because of it. But I’m not discouraged, really; I know that after this craziness is over I’ll have more time and brainpower. Of course, I’m going to England in under two weeks, so it may be awhile before I’m back to a decent routine. One thing that has been bothering me is the fact that the design of my blog right now is not the design I wanted. It’s more like a design I conceived and never finished in 2004. When I put this thing together, the look was secondary to getting the structure workable. Now that I have the blog set up with an external stylesheet, I will hopefully be more easily able to change the look. A redesign of this blog will need to take a backseat to other things, though: my website project with Mike, my webcomic project with Sam, the redesign of and new shopping cart implementation for my parents’ business website, etc. I’m also rereading (or rather, reading, since I never actually finished it) Getting Things Done. Hopefully I will learn some techniques to better organize my time and keep from stressing out over everything I want to do! I’m still digesting it. I read a lot of it all at once the other night to get to the end. My marathon reading session coincided with a lot of seemingly random violence in the book. It’s going to take me some time to process. My next read is The Book of Night Women by Marlon James (suggested by Marie). I started it last night. The other day I posted on Twitter, “It is absolutely GORGEOUS outside in Augusta, Georgia!” Stu responded that that tweet put him in the mood to reread his Pat Conroy novels. I’d never read any Conroy, so I asked Stu for suggestions, and on his advice started reading The Great Santini. This post contains my thoughts so far; I’ve just made it to Chapter 12. The book’s about a family dealing with an abusive father, a Marine fighter pilot named Bull Meecham who is known as “The Great Santini”. The prose simmers with nervous tension as it draws slowly towards what you know is coming, what has been foreshadowed from the beginning. You don’t see the abuse directly at first. You have to wait several chapters for it. Instead, you see almost-abuse. The story flirts with the line Bull Meecham will cross, and since you don’t know where the line actually is, you never know when something bad might happen. It’s very artfully done. It gives you the same feelings the children are dealing with. The first horror is a fairly small one compared to the dreadful things Bull Meecham has been threatening. But that leads to some specific revelations that up the tension. It’s certainly not over yet. I’m curious as to where it will go and what conclusions will be drawn. Here in the night [Ben] thought that somehow the secret of this marsh-haunted land resided in the quivering flesh of oysters, the rich-flavored meat of crabs, the limp of the flower boy, and the eggs of the great turtles that navigated toward their birthing sands through waters bright with the moon. But other times Conroy does a little too much “tell” and not nearly enough “show”. There are even times when the perspective changes so abruptly that entire blocks of prose are cast in confusion, and I’m not sure that effect was intentional. …Ben thought that he had a great equalizer working for him, called youth. Ben was five feet ten inches tall and weighed 165 pounds; his father was six feet four inches tall and weighed 220 pounds. But Ben had been correct when he observed that Bull had thickened over the last years. He had become heavy in the thighs, stomach, and buttocks. The fast places had eroded. Rolls of fat encircled him and he wore the sweat suit to keep his new ballast unexposed. He was planning to lose weight anyway. There was nothing Bull Meecham hated worse than a fat Marine. It took a long time for Bull to warm up and it gave Ben the chance to study his moves. This sudden intrusion and just as sudden withdrawal of Bull’s perspective is extremely jarring. This isn’t the first time we see Bull’s thoughts, but it is the most awkward so far. If the text had continued in Bull’s perspective it would have been fine, but instead it snaps right back to Ben’s. I considered whether or not that paragraph was Ben’s impression of his father’s thoughts, but it doesn’t really read that way–especially not the line “he was planning to lose weight anyway”. Chapter 9 begins with a description of a woman who has come to the Meecham house. We do not see her thoughts. As if watching a movie, we read about how she arrives at dawn and waits. Then we see Bull Meecham run out the back door, and before we know it we’re in his mind. The woman was sitting on the back steps when Bull Meecham hurried out the back door. He was on his way to the air station for additional briefings on the squadron he would soon command. Before he reached the first step, he stopped and regarded the dark Buddha blocking his passage. If there was a single group in America that Bull had difficulty with over the simplest forms of address, it was southern blacks. He had nothing at all to say to them so he generally retreated into his self-aggrandized mythology. We could understand these points about Bull by observing his actions. We don’t need to have it all spelled out. And where is this commentary about Bull coming from, anyway? Our narrator sometimes has Ben’s observations, very rarely Bull’s or another character’s, and then sometimes, as now, a seemingly objective insight. The shifts are confusing and break the rhythm of the prose. Just as we sometimes get too far into a character’s head or receive a bit too much spoon-feeding, sometimes we also don’t get enough description of the action of a scene. In Chapter 10, Bull says hurtful things to his children, but they don’t seem much different from the things he typically says, so when all of a sudden the kids are crying, I’m surprised. I could have used a few more details to ease the transition. Not an explanation of why being teased for being short would upset Matt, but an inkling of his mental state before and during the teasing. Was his face flushed? Did he look earnest when he was begging to be allowed to play basketball? Sometimes you have to read a little too far between the lines, and other times there’s nothing to read because it’s all overexplained. Conroy shines when he’s presenting action and dialogue. One of the most powerful scenes, Ben’s talk with his mother in Chapter 11, includes very little description at all. There’s repetition of three themes–shoe tying and untying, cigarette lighting and smoking, and Bull’s basketball practice outside–and then there’s revelatory dialogue, evocative in its sarcastic directness. And that’s all that’s needed. The best scenes with Bull don’t go into his head at all, but simply describe his behavior: Chapters 1 and 6, in which he gets up to no good in his natural habitat, give us far more insight into the man than a discussion of his history, pride, and competitiveness ever could. The problems seem to crop up during critical scenes involving Bull’s abusive behavior–scenes between Bull and his children. I’m wondering if that’s the reason for it. It’s known that this book is based on Conroy’s own childhood experiences. This sort of thing has got to be difficult to write about, especially when it’s happened to you. I’ve never been the victim of physical abuse, but I can relate in other ways. There’s a guilt and a shame that are extremely hard to get past. It’s easier to deal with individual pieces of the puzzle than it is to attack the main problem all at once. That could explain why scenes involving Bull and Ben on their own are fantastic while scenes in which they interact are less so. Were I Conroy’s editor, I would suggest not writing or appearing to write from Bull’s perspective at all. I’d treat all standard scenes as if I were an objective, non-omniscient observer, including scenes involving Bull. But I’d go into Ben’s head. The book may be called The Great Santini, but it’s about Ben. That was made obvious in Chapter 2. If Ben’s in a scene, I want to see the scene through him–and not through anyone else. Those are my observations so far. Of course, I’m not done. We’ll have to see how my evaluation changes as I continue reading. I recently subscribed to Better Homes and Gardens. My mom used to get this magazine when I was younger, back when the boys and I all lived at home and I shared a bathroom with Mom and Dad. There was always a basket next to the toilet filled with magazines that I would sit and read longer than necessary, and BH&G was one of those. My favorite parts were always the floor plans and photographs of home and garden makeovers. I loved seeing the unique ways people would dress up their existing spaces. I still remember a tiny yard with a high wall that was transformed into an English garden, and what a strong effect that had on me. I learned then that you can do a lot with a little…even though it was years before my dreams of living in a mansion transformed into a quiet desire for a small, functional, pretty home. There is a gorgeous little Massachusetts cottage in the June 2007 issue that was originally a boat house. That kind of coziness and simplicity really appeal to me now. There’s also an 850 square foot California house that serves as the first home for a young couple and their baby. The story boasts a floor plan, much to my delight. The magazine is bigger than I remember. I don’t know if it actually is bigger or if I’ve just grown accustomed to the size of Taste of Home, which is small enough to be saddle-stitched. BH&G is held together with glue, like a book. It made it a little more difficult to yank out all the advertising inserts. I read The Last Unicorn for the first time. I started it yesterday and finished it today. I particularly enjoyed getting to know more about Schmendrick, and seeing him come into his magic. I was also glad to see Molly Grue perceived as beautiful. I had always thought she was. It was nice that someone in the book also thought so. I’m glad some of the proceeds from my DVD went to Beagle. Next up: Snow Crash . Also for the first time! I love it when Den Beste points these things out. What you see or read on the news really is just a matter of how the news organization wants to frame the information they’ve received. I finished off Harry Potter and the Prisoner of Azkaban with time to spare before seeing the movie last night. I must say, it’s my favorite book so far. That may have tempered my opinion of the movie, too, because I came away from it feeling like it was the best of the three, while Kelly was far less impressed. Having blown through three Harry Potter novels, I’m starting to feel like a real reader again. In fact, tonight I finally started reading The Time Traveler’s Wife…and it is really, really good. I’ve missed being a reader; I haven’t been voracious about it since sometime in high school. The only thing I don’t really like about reading is having to handle the books. There is no comfortable way to read. I have three typical positions, which I switch off as I get uncomfortable: on my back, holding the book over my face; on my stomach, with the book resting on my pillow; and sitting cross-legged, leaning down towards the book. Depending on the size and weight of the book, lying on my back, which is otherwise the most comfortable position, can be a true hassle. It might be fun to take a book over to the workout room at the apartment clubhouse and read while walking on a treadmill. I may try that at some point; more exercise would definitely be a good thing. Work has been much better than it was on Monday and last week. I’m not sure what my problem was, but at least part of it can be attributed to hormones and lack of sleep. Yesterday I had something of a bad experience on a call, but I refused to let it bother me. I was pretty impressed with myself afterwards. If it had happened on Monday, I’m not sure what would have happened. Mari and Brooke and I were supposed to bellydance today, but things didn’t work out. Hopefully we will be bike-riding tomorrow, and maybe we can squeeze in some bellydance too. I would like to get myself on a regimen of going through all the basic bellydance motions, several times each, every day. I got the idea from Mari; it would be a fantastic aerobic/muscular workout. Now I just need to figure out what time of day I want to do it. I would have time in the morning if I got up at 5 (like I usually try to), but I would also have time right after work, in the “dead” time between then and when I have to start making dinner. I suppose I could just dedicate myself to doing it during one of those two times. I need to go grocery shopping and pick up some meat for the week, and vegetables. Perishable food is the bane of my existence…I have trouble actually using it up before it goes bad. At the same time, though, I really want to start eating fresh foods, and stop using packaged/processed products. As a final note…I found a couple new blogs to read recently. One belongs to a 17 year old and the other belongs to a 73 year old. I found them through Blogger’s new profile feature…I have “emotion” listed as one of my interests, and out of curiosity I clicked it to see if anyone else had used that word too. Interestingly, only a handful of people came up. Of those, I found myself drawn to these two: goei and rare. rare has a sort of rambling, stream-of-consciousness, yet somehow practiced and beautiful flow to his writing, and yesterday he wrote something that really touched me, so I would like to share it. 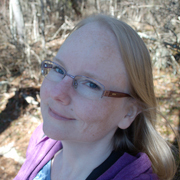 I'm Heather Meadows, and this is my blog. I've got some opinions, and occasionally I write about them. I love to explore our beautiful world and hear people's stories, and I try to share mine here when I can. My hometown is Nicholasville, Kentucky, near Lexington. I lived in Augusta, Georgia for a little over eight years, and now I'm in Marietta, Georgia, near Atlanta.